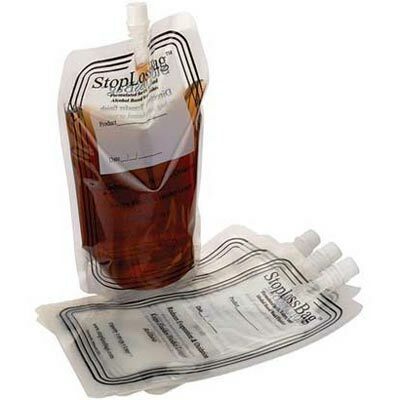 StopLossBags™ are designed for oil, water, & alcohol-based wood finishes. They are not suitable for lacquer. 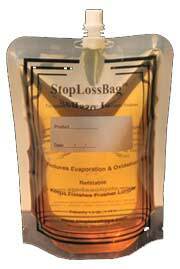 StopLossBags™ allow you to preserve the fresh off-the-shelf quality of wood finishes. The specially formulated 3-ply construction helps prevent loss of solvents while a special gas barrier inhibits oxygen penetration into the bag. Each bag holds 1.05 quarts or 1.0 liters. Almost all woodworkers have had the experience of throwing out cans of skinned-over varnish. Metal cans are excellent for transport and storage until opened, but are not designed for dispensing the finish or the exclusion of oxygen after some of the contents are used. Once the finish has been transferred to a StopLossBag it is easy to dispense, a lot or a little, into a cottage cheese container or other similar wide-mouthed container for applying the varnish. After pouring out what you need simply squeeze any bubble out of the bag before tightening the cap. Filling the bag can be done by using a our StopLossBag™ Collapsible Funnel. 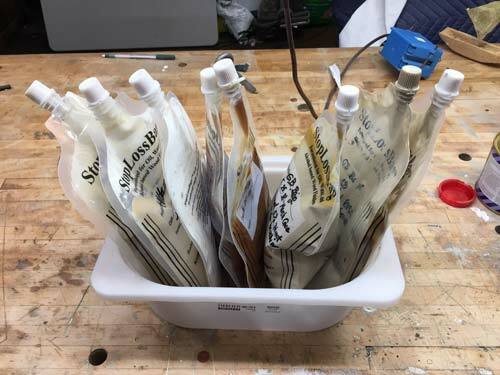 It is easy to transfer liquid with theStopLossBag Collapsible Funnel which fits over an opened quart or liter can and the spout of a StopLossBag. 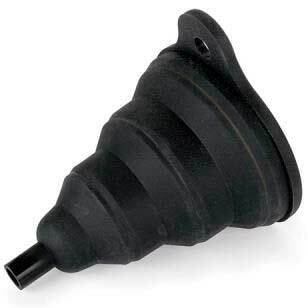 The funnel is made with a special flexibility which allows it to stretch over the mouth of an opened quart or liter can, while the small end accepts the spout of a StopLossBag™. Filling is easy. Begin by pulling the top of the funnel over the opened can. Next, blow air into the bag to fully inflate it. This is necessary to give enough air to allow for a complete transfer of varnish into the bag, and air into the can. After inserting the spout of the inflated StopLossBag into the small end of the funnel, invert the three connected items (see video, below). The varnish will begin to flow on its own, but a gentle up and down bellows action allows you to complete the transfer more quickly. Cleaning is easy for most woodworking varnish. Place the funnel on a folded paper towel to let it dry overnight. The dried varnish will not adhere to the funnel and can be peeled from the inside. Cleaning can be solvent free. I'm pleased to issue the following test results of StopLossBags®. We have just concluded 36 months of testing of StopLossBags . The results are that the polyurethane stored for three years retained 99.73% of original composition. The color of the polyurethane had ambered, or darkened from the original light yellow to medium brown but was still clear with no cloudiness. At the spout there was some thickening of the polyurethane, much like gel. It was, however, confined to the spout, and the rest of the finish retained its solvent-to-solids mix. Though it has not be further tested we expect its ability to produce normal results in protecting wood to be unchanged. The results from two years had been 99.83%. While we expect most woodworkers will use their varnish within twelve months, we're genuinely pleased that our bags pass that threshold effectively. I hope your customers continue to find them a beneficial to their woodworking and boatbuilding. I now have 8 stop-loss bags on the shelf that replaced the remnants of 8 cans of paint and varnish I had been “saving”, and they all fit in one box slightly larger than a shoe box. Great space saving invention, and it is easy to get a squirt of paint when I need one after the inevitable collision at the launch ramp [yesterday].